Urban Footprint identifies the extent of land needed to accommodate the regions urban growth to the projected year of 2031.
achieve more compact urban form, avoiding natural hazards and further fragmentation of natural resources. reduce pressure on natural resources and lower greenhouse emissions. Continuing outward expansion of urban development involves permanent loss of natural habitats and changes to the physical environment. This in turn puts pressure on SEQ biodiversity and scenic landscapes. Land clearing contributes significantly to greenhouse gas emissions. Beerwah east-one new major greenfield growth area. Next to rail line, adjacent to Caloundra south development area, rail corridor runs through, but long term forestry leases must first be reconciled. The objective is to strengthen and raise economic profile of the region and to identify and describe appropriate land use responses. The main strength in the area is tourism. increase density and activity in centres and locations with good access to existing and planned public transport. any regional plan must plan for long term and consider transport required before supporting change. The decrease in use of public transport, walking and cycling to work, and increase in private care usage linked to low density suburban growth across regions. Sunshine Coast will require new water supply sources-options are harvesting water from Mary River or desalination plant. -Qld renewable Energy Plan including rooftop solar installations, solar and windfarms. "The unique biodiversity of the region drives the ecological processes that natural assets require to provide the ecosystem services that underpin a wide range of economic activities and benefits to the community. Maintaining and enhancing the biodiversity is critical for a resilient community and a strong economy i.e. : better prepared for climate change and able to recover from impacts like extreme weather." high levels of environmental protection, reducing greenhouse gas emissions. key environmental and cultural values of regional landscape. State Planning Policy sits above Regional Plan. It contains policies for protection of biodiversity, coastal environment and cultural heritage. Since 2008, 87% of clearing of natural vegetation has occurred in Urban Footprint and priority development areas. This is the consequence of a concentration of urban development in Urban Footprint zones. Management of vegetation and green space inside the Urban Footprint for recreation, flood mitigation and habitat values is important for a sustainable community. Waterway Health:-Healthy Waterways Report Card: Since 2002 the region has averaged a rating of C which means some critical habitats are impacted. December 2015, the 21st United Nations Framework Convention on Climate Change in Paris, the international community including Australia, accepted unanimously that climate change is real and urgent action is required to reduce global carbon emissions. The government released the climate change discussion paper in May 2016 called: "Advancing Climate Action in Queensland: making the transition to a low carbon future." It will get hotter (1.5 c to 3 c warmer) and drier (5-15% reduction in rainfall). Brisbane will experience a climate like Bundaberg by 2050. Sea levels will rise. Urban heat island effect caused by lack of tree cover and impermeable surfaces exacerbates impact of heat waves and flooding. Studies show residential tree cover cooled surface temperatures by up to 5 degrees. Vegetation plays a role of buffering community against full impact of extreme events. Tree cover and healthy waterways reduce urban heat island effect. 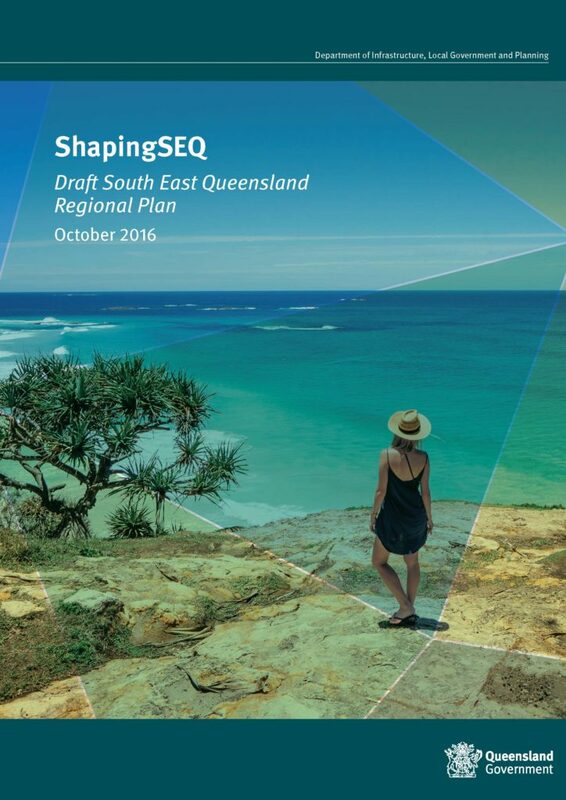 So the draft SEQ Regional Plan 2016 has been seeking feedback from community and councils and key stakeholders. Focus is on affordable housing focussing on unlocking land identified for urban development but as yet underutilised. Urban Footprint (UF) is discussed on page 83 of the draft plan. Once identified, it can be used to accommodate urban growth within the area, but may be deemed unsuitable because of the need to protect significant vegetation for national environmental significance and biodiversity networks. The draft SEQ plan is relying on local government planning schemes to determine the most suitable urban zone for each land parcel within the urban footprint. UF is a tool for managing regional growth. UF promotes compact settlement pattern and consolidates urban development within established communities. Focus is on increasing capacity of UF rather than expanding its boundaries. UF boundary is clearly defined. New areas may be considered for inclusion in UF where they are physically suitable, are of a logical expansion of an urban area, have ready access to services and employment and maximise the use of urban infrastructure but exclude areas of national environmental significance or impact important, sensitive natural environments in and outside the area. The State Planning Regulatory Provisions apply to land in the UF where in a major development area, ensuring that the development does not adversely affect the future development intent of these areas. Chapter 3 deals with the Northern Sub Region-The Sunshine Coast. Just south of the Urban footprint located in Caloundra South there is as soon on the map-figure 14, page 20 of Draft plan, there exists 2 major greenfield areas, Caloundra South and Beerwah East. Beerwah East has been included in UF as it is seen as important land supply-integrates with Beerwah and serviced by road and rail. Halls Creek has been marked for future urban growth. The intent is to protect their future potential, not to promote or support their investigation for urban purposes. The plan states that this is not a development commitment and does not imply that all or part of this area will be made available for urban development in the future, unless the Queensland Government's monitoring of land supply and development activity indicates infill or other benchmarks may not be accommodated. (page 137) (Benchmarks are the dwelling supply benchmarks and employment planning. Infill development is development on land inside existing urban area.) So though there is no direct development commitment or implication that this area will be made available for urban development in the future, neither does it state that it will not happen. It is left open, depending on circumstances that may arise to revisit these areas. areas outside of the Urban Footprint that may be suitable for future urban growth, subject to further investigation and dwelling supply analysis as determined by the Queensland Government. These areas are not to be expected to be needed to accommodate dwelling supply or employment planning benchmarks of Shaping SEQ. Halls Creek is not listed under locations that are to be protected and nurtured for their biodiversity. As Halls Creek feeds into Pumicestone Passage and the RAMSAR wetlands which are to be retained as an inter-urban break as being seen as regionally significant green break. The Qld Government is to work with Sunshine Coast Council to ensure its long term protection. Sunshine Coast Council have put out some fact sheets regarding the release of the draft SEQ regional plan. Council commissioned experts to investigate the environmental, recreational and economic values of the Regional Inter-urban Break and concluded that this area protects the water quality of the Pumicestone Passage. The council has reaffirmed its position to protect the Regional Inter-urban Break. Beerwah East has an area of, 3662 hectares and is largely owned by the State government and has a potential yield of 20,000 dwellings and 300 hectares of industrial land. Halls Creek has an area of 2,426 hectares is largely in single private ownership and as a potential yield of 10,000-12,000 dwellings. can only accommodate approximately 10,000-12,000 dwellings which will not meet the long term growth needs. The Sunshine Coast Council's position is that Beerwah East is the preferred long term growth area for the Sunshine Coast and that Halls Creek is not needed for urban development and should not be included in the urban footprint as it is an essential part of the Inter-urban Break. While SCEC does not support Halls Creek and seeks to have it removed from all planning documents completely, we also consider that robust assessments and consultation must be undertaken to determine whether Beerwah East is appropriate for development or not. We also challenge the presumption and apparent acceptance of continued unsustainable population growth.